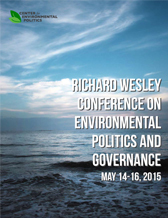 Thanks for your interest in the 2015 Richard Wesley Conference on Environmental Politics and Governance organized by the Center for Environmental Politics at University of Washington, Seattle (for the Call for Papers, click here). The interest in this conference exceeded our most optimistic projections. We received around 290 abstracts! These abstracts involved the contributions of over 400 scholars from 40 countries. They represented diverse disciplines including political science (IR, CP and AP), sociology, economics, business strategy, geography, anthropology, theory/philosophy, and history. After a double-blind review process, we accepted 32 papers for presentation at the conference. A review of these submissions shows the tremendous vitality and energy in the study of Environmental Politics and Governance (EPG), both in terms of substantive areas of inquiry as well as methodological approaches. Clearly, there is a huge demand for a forum where EPG scholars can come together on a regular basis to share their work. A key goal of this conference was to contribute to this objective. The EPG steering committee has decided that annual conferences will rotate between non-US and US universities. The 2016 conference will be held in Gerzensee, Switzerland from June 16 to June 19, 2016. For more information, please visit the conference home page.